Home Biblical Growth Secrets Are We To Keep The Old Testament Law? If So, How? Did you know that Paul And All Of The Apostles Taught Obedience To The Law Of God? There were times in the gospels when Jesus was not very clear and even today we read some of His sayings and we debate endlessly about what they could mean. What did Yeshua Jesus say ? There were other times when Jesus took His time to be exceedingly clear, and we find one of those moments in Matthew 5:17-19…..
Now could this be any clearer? Jesus says that anyone who breaks the commandments and teaches others to do the same “will be called least” in the kingdom of heaven. What did Paul Say and Do? Oh, but Paul said not to keep the Law? When then did he keep it? For we maintain that a man is justified by faith apart from observing the law. Is God the God of Jews only? Is he not the God of Gentiles too? Yes, of Gentiles too, since there is only one God, who will justify the circumcised by faith and the uncircumcised through that same faith. Do we, then, nullify the law by this faith? Not at all! Rather, we uphold the law. So was Paul a hypocrite? No, he lived what he believed. He preached salvation through Christ alone. He preached obedience to God’s commandments. So did all of the early Christians. Why were we all never taught these things in church? How do we go about keeping the law today? It may seem keeping the law is complicated, but it is not. If you truly look at the commandments given to us, the majority of them pertain to the instructions to those who were in the temple. The first thing you need to know, is that “keeping the law” DOES NOT make you any better than any other believer. If you truly were to compare yourself to Christ we all fall really short, and have nothing to boast of. Even when you attempt to keep the law, you will fall short of keeping it perfectly. For all those who want to gloat about keeping the law, remind them if they have ever held a grudge against someone, anytime in their lives. To hate means to murder according to the bible. We are saved 100% what Yeshua did on the cross, so that no body can boast how well they keep the law. Why Do We Keep The Law Of God? We keep OUR Father’s commandments because his guidelines show us how to walk through this life. His instruction guide is divine, and are given to us for a purpose. If you are not keeping the law,but are a Christian, find comfort in the fact that you are already following a larger amount of the law. Much of the law is summarized by Yeshua in the New Testament. However, the church as a whole is missing a few elements, those of which are – keeping the Sabbath, the yearly festivals found in Leviticus, new moon, the food laws, and the Sabbatical and Jubilee Years. Realize that these these commandments are a learning process. Guaranteed you will mess up on keeping the law, and that is ok. Pick yourself up, and know that tomorrow is a new day. We aren’t saved by the law, but by faith, so take refuge knowing that you are walking on the narrow path and just by keeping the instructions you are set apart from the world. Sabbath comes once a week. It isn’t Sunday, but rather starts on Friday night at sundown, and goes to Saturday night at sundown. It is important that you get the date correct. The bible gives us a couple guidelines to follow. The First is that we are not to buy and sell. So in other words, you have Sunday through Friday to go grocery shopping, and any other transactions. Second, we are to rest and keep it holy. Beyond those two areas, let the Holy Spirit show you how to keep Sabbath. This day is supposed to be joyful, and a time to rest and relax. 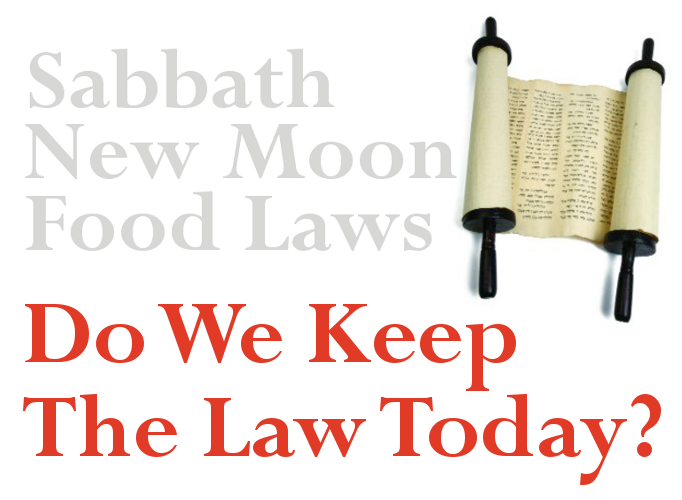 Don’t let others add to your sabbath by adding on laws that you are to obey. It isn’t supposed to be a burdon. Others will keep it different than you, and that is ok, so long as you keep those three things in mind. Know that none of us keep it perfectly, and that is ok. Some cook on this day, and you will find many people who say that is wrong. Some will say that it is a time only to study the word, and others do enjoy things like gardening. Go to prayer and ask the Holy Spirit to guide you in what things are ok to do on the sabbath. You will soon see you are tremendously blessed for taking that day off. If you work Saturday, pray to God to move around your schedule. He WILL make a way for you to follow his commandments. Work towards the goal of taking the sabbath off. In the past, every person we had talked to, whom wanted to follow the sabbath were given the day off. In many of the cases where these people had faith to move their schedules to obey the sabbath, they were promoted in their jobs. Figure out what time sabbath starts by typing in your city in google, along with the words “sunset”, and google will tell you the exact time the sun sets. It can be simple to keep. The Festivals are life changing, and you change the way you view the things of God. We have written several articles regarding the feasts below, which will give you some more information on these holidays. If you feel out of your element at first, that is ok. You will grow into them over the years. Again, there is NOT a lot of rules to these occasions, of how to keep them. Feast of Tabernackes tells us the first and last day are holy, and are days that you should get together and hold a service. Yom Kippur is the only day we are commanded to fast on. Other than that, come together with other believers and celebrate the meaning of them. 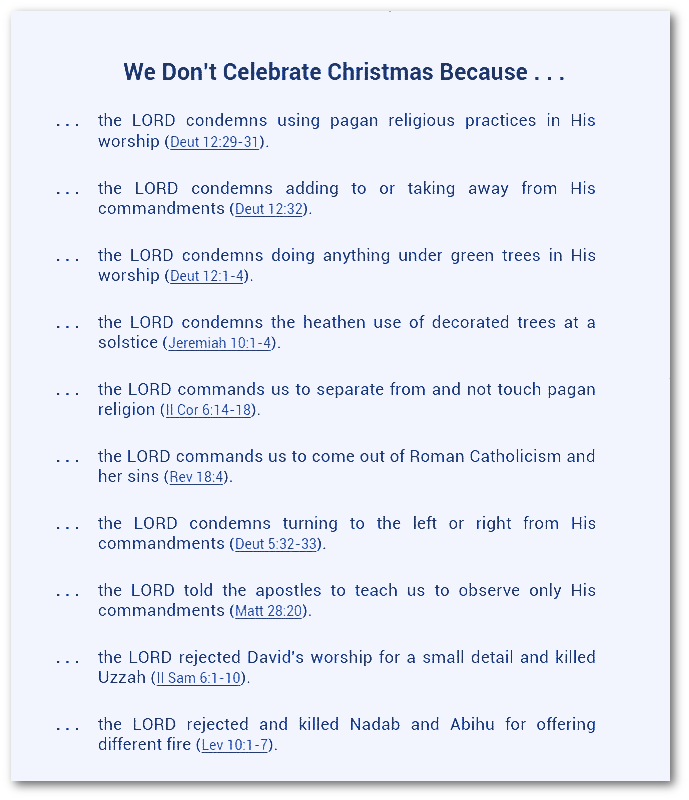 Come up with your own ways (other than pagan ways) to make them special, because THESE are OUR holidays as believers. New Moon is a day that we take off, and have the luxury to do so, because we have our own business. Although many people cannot take off a random day from their employer, and it doesn’t say in the scripture that you have to. Although, if you can, you should treat it extra special. If you have to work, spend some extra time in devotion towards the Lord. Set it apart, and make it special. Determining the day online can be really complicated, so we have found David Herzog has a calendar that has a giant moon on the day it starts. It is a great visual aid to keep track which day is new moon. If you donate $30 dollars or more, you can get a calendar from their ministry. You might miss new moon at first, and we certainly did, so don’t beat yourself up over it. Patterns can take time to become a lifestyle. The food laws are very simple to keep, though it can be hard for some people to adjust to. Leviticus 11 will give you a full list of what to stay away from, although you will find many of the animals that it lists are not animals we eat anyhow. In simple terms, stay away from anything that has pork and fish that have shells. At first, I was rather flimsy in keeping this law, until I saw WHY eating pork and lobster was forbidden. All the animals mentioned in Lev 11 are animals which are scavengers, OR were made to clean the environment. Pigs for example store toxins in their flesh, and so do shell fish, and then are passed on to you when you eat them. In fact, many coastal cities are learning the powerful cleaning abilities that shell fish have. By simply dumping tons of shellfish in their waterways and lakes, the fish do a better job of cleaning up the garbage than the machinery can do. It is no wonder many people have cancer when they eat a lifetime of this toxic food. Did Yeshua keep the law? Did the disciples keep the law…. They did… we see from the words of Paul, and in Luke 53:54-56 we see them keeping the sabbath. Is keeping the law for today? The law is an instruction guide. It says very clearly in so many scriptures (John 3:16-18),Eph2:8,9) (Acts 15:9,11) and Romans 10:9,10) that we are not saved by the law, but though faith. The law is a delight and not a burden. In the law there is justice! If you read Paul’s words in Romans he goes back and forth, back and forth, back and forth in his argument trying to get his point across to those who kept the law that it is by faith that we are saved, yet, we still uphold and obey the law. It is easy to take his words out of context, but know you know, you need to read his words in context. Does keeping the law count towards salvation? No. It is only an act of love and obedience that we do it. We STRIVE towards holy walk, even though we will never attain it. Our Walk and Lifestyle: What does that Look Like? We are told that there is a remnant of God in Revelation 12:17, and these believers will keep the commandments of God (keep the law), AND and have the testimony of Yeshua (saved by faith). One can easily get caught up in learning all the things of the law, and forget about the great commission. Keeping the law for the most part, just becomes a lifestyle, but so should many of the things that the disciples did in the early church. We are also told at the end of Mark to preach the gospel to the entire world. Are we reaching out to the world? Are we capable in offering deliverance to others? Do we speak in tongues as the early church did, and Paul said he did more than any other believer? Are we seeing healings? Are we arranging our lifestyle to incorporate DAILY personal worship to the Father, and prayer? 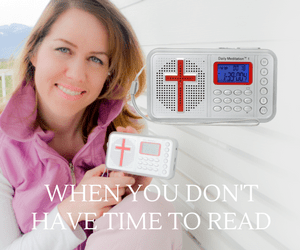 Do we read our bible daily? We see tremendous healing, tremendous faith in the early church. 1 Corinthians 4:20- 20 For the kingdom of God is not a matter of talk but of power. So as believers shouldn’t the works be more than just mere talk? In one instance in one of his letters he addresses someone who is boasting. He replies saying that he will see what “power” this man has. You see, if you are truly a believer your actions will accompany your walk. Re-look at the end of Mark for the actions that should accompany a believer. You see, in our walk there should be a combination of things. The law is great, and we should be keeping it, however we have also come to realize there is a heck of a lot more to our walk that we dismiss so quickly. – What about evangelism? What about healings? What about Intercession? How about fasting? What about prayer? What we forget is that God gives us a perfect recipe or formula to a walk that is full of power and success. There are a number of ingredients that go into a good batch of cookies, not just the law. If you look at those people who are able to walk in the supernatural about 90% of the cases are those who devote themselves to prayer and worship on a daily basis. In addition to that, they fast 2 times per week. God is looking for a yearning heart to worship him. A person who desires him like someone who is thirsty. Remember that keeping the law can puff people up, yet we are told that love builds up. We are to have a combination, as just having dry batter will not make cookies without the rest of the ingredients. There is a combination – or a group of things we should master in our lives. What about a mature believer? What would you expect to see from him or her? I mention these things because there are some people who have pride in keeping the law, but rarely do I ever hear these things discussed. Nobody wants to talk about fasting and prayer, yet it is a great way to get closer to our Father. There is a recipe our father gives us, a combination of things that are needed for those who walk down the path. We shouldn’t ever have pride in our walks, because none of us are truly keeping all the elements or ingredients. Should we try? Yes! Will we fall? Yes! we sure will. Hopefully over time, with the word of God, with the help of the Holy spirit, we will get things right. Luke 16 : 16 of the kingdom of God has been preached, and everyone is forcing his way into it. The beauty of the word of God, is it will show you interesting and new things over a lifetime. This is due to the refinement of the Holy Spirit. It is a fight to stay passionate for God, but there is a reward for doing so. Why Should We Keep God’s Instructions?